The story that has been told of the small, white, brick house at the northeast corner of Fort Salonga Road (NYS Route 25A) and Makamah Road is of an eccentric old unmarried woman—Miss Mary Osterby—who worked the farm dressed in her father’s Civil War uniform and sold beer to workers from the local brickyards. It is a charming story of a quaint by-gone era. Unfortunately, it is not accurate. The real story is more complex. Miss Mary was not an unmarried spinster; nor did her father fight in the Civil War. Bentte Marie and her husband Bernard Osterby emigrated from Denmark in 1881. He was a 47-year-old veteran of the Danish army, who reportedly received several medals for bravery. She was 13 years younger. They had been married for two years. There are indications that he may have had a first wife and was the father of ten children, although this aspect of his life has not been confirmed. Bernard Osterby purchased the four-acre property in March 1890 from the heirs of the Reverend Moses Rogers for $450. Moses Rogers was born in 1793 and was one of the first Methodist ministers in Huntington. Rogers had purchased the property in 1854 for $800. The property included a large eighteenth century house. This house may have been associated with the Presbyterian Church that was built at this corner in the late 1700s. According to an account from the Reverend N.S. Prime, the church was removed in 1829 and “rebuilt at Red Hook” near the current location of the shopping center on the south side of Route 25A, west of Vernon Valley Road. It is unclear when the Osterbys came to Fort Salonga, but they were here by 1888. In that year, Jacob Jacobson had filed a complaint against Bernard Osterby for selling liquor without a license. A trial on the complaint was set to begin, but Jacobson did not appear. It was alleged that Osterby had threatened Jacobson. In any event the case was dismissed, but Osterby was immediately re-arrested on a previous charge of disturbing the peace. Osterby continued to sell liquor illegally. After a trial before Justice Strawson in Northport, he was convicted on that charge in 1890 and fined $50. Justice Strawson heard about another complaint against Osterby two years later. Johanes and Maren Kasso were recent Danish immigrates living near the Osterbys in a cottage at Breeze Hill farm (now Indian Hills Country Club). Mrs. Kasso was a 32 year old mother. She complained to Justice Strawson that the 57-year-old Osterby repeatedly went to her house while her husband was away. It is unclear if criminal charges were ever filed, but Osterby again resorted to threats. While out hunting, he ran into Mr. Kasso, pointed his gun in Kasso’s face and threatened to blow his head off if he didn’t mind his own business. Osterby was identified in an article in The Brooklyn Eagle in 1892 as a saloonkeeper. He apparently catered to the workers in the nearby brickyards. Apparently several others were also selling liquor—illegally—in the area and “the neighborhood has gained the reputation of being decidedly ‘tough’.” So tough, in fact, that in 1896 blood was shed at Osterby’s place. Osterby had taken advantage of a new liquor tax law, known as the Raines law, which allowed hotels to sell liquor. So his place became a hotel where a number of foreigner workers from the brickyards stayed. Two men, who apparently knew each other, boarded there without incident until one summer Sunday morning while one of them was eating dinner, the other, without saying a word, came in, picked up a large carving knife and struck the first man in the face, nearly cutting off his nose. The other boarders were so shocked that the assailant was able to make his escape without any attempt being made to stop him. The next incident, four years later, was even worse. At two o’clock on the morning of January 15, 1900, the entire house was destroyed by fire and one of the boarders, a 34-year-old immigrant, did not make it out of the house. The fire may have started when a gas lamp exploded. Fifteen people were staying in the house at the time, including two children. Osterby was awakened by the crackling of the fire and ran from room to room waking the boarders. The woman staying with the two children escaped with one. Mrs. Osterby returned to the house to rescue the other, a six-year-old girl. Mrs. Osterby was badly burned on her face and hands. The Osterbys lost all their belongings except for a small box of papers. The house was subject to a $1,000 mortgage the Osterbys had given in March 1899 to secure a loan from Francis Olmsted of Northport. The house was insured for $1,000. But it had been sold about two weeks before the fire to satisfy a judgment obtained by James O’Rorke, who had sued Osterby for unpaid wages. No deed from this foreclosure sale could be found and the fact is that the Osterbys continued to live on the property. According to the 1900 census, they were renters, but by 1910 they were listed as owning the house, subject to a mortgage. Somehow, the Osterbys managed to hold onto the property. An intriguing, but puzzling clue can be found in the County Clerk’s records. On October 18, 1900, three documents were filed with the County Clerk. The first is a mortgage dated October 13, 1900, which secured a $400 loan from Lewis Smith. The security was described as the property that “this day was conveyed” to Bentte Marie Osterby by Lewis Smith. The other two documents were deeds transferring the property—first from Osterby to Smith and then from Smith back to Osterby. Both deeds were dated October 13, 1890—ten years earlier than they were recorded. The deed from Bentte Marie Osterby to Smith identifies the property as being the same premises conveyed by Bernard Osterby to Bentte Marie Osterby on October 26, 1891. Obviously the deed is a fake because it refers to a document with a later date. And according to the mortgage the transfer of the property was contemporaneous with the mortgage, i.e. October 13, 1900, not 1890. It is also interesting that the deed by which Smith conveyed the property back to Osterby—supposedly in 1890—contains a restriction: “the said premises shall not hereafter be used for the sale therefrom or thereon of any spirituous liquors and in case such condition is broken the title to said premises shall be forfeited and the premises shall revert to the party of the first part,” i.e. Lewis Smith. The one conviction against Bernard Osterby for illegally selling liquor was in July 1890—three months before the purported deed restriction. But he continued to be identified as a saloonkeeper and he had obtained a Raines law certificate, which is issued to sellers of liquor. We can speculate why these bogus deeds were created and filed. Presumably, Osterby collected $1,000 from the insurance policy. But there is no evidence that the $1,000 Olmsted mortgage was ever paid–it was still open in 1957. Most confusing of all is how they managed to hold onto the property. Perhaps chastised, Osterby listed his occupation as farm laborer in the 1900 census. But in 1910 he listed Boarding House. It seems likely that the existing brick house was built to replace the house destroyed in the fire in 1900. The original section of the existing house would have been too small to accommodate 15 people. Brick construction was virtually unheard of for houses built in Huntington before the late nineteenth century. Whereas using bricks to build a house after a devastating fire, especially when brickyards are located so close, makes sense. In any event, Bernard Osterby died in May 1910. His widow re-married by 1920. Her new husband was an Irish immigrant named John Merry. He was 16 years younger than his new wife and worked as a road laborer. Mary Osterby finally sold the property in 1921 to Raymond Bloomer of Manhattan reserving for herself a life estate to all the buildings and the soil under farm tillage. Bloomer could clear the woodland and build there. Bloomer gave Mary Osterby a $1,000 mortgage, which was cancelled in November 1926. Mary was still alive in 1926, but her date of death has not yet been found. In 1948, Jane Bloomer Goverts inherited the property from her uncle Raymond Royce Kent, who died in Florida. It is unclear who Raymond Royce Kent was or how he acquired the property from Raymond Bloomer. There appears to be some family relationship because Kent’s niece was also named Bloomer. Could the two Raymonds be the same person? Goverts eventually lived in Rochester and may not have lived in the house. In the summer of 1949, Eugene Mudge of Brooklyn rented the house. Mudge purchased the house with one acre in 1957. Mudge’s title insurance company evidently found the 1899 mortgage to Francis Olmsted that had never been cancelled. Goverts filed an order to show cause in December 1957 to get the “ancient mortgage” discharged. 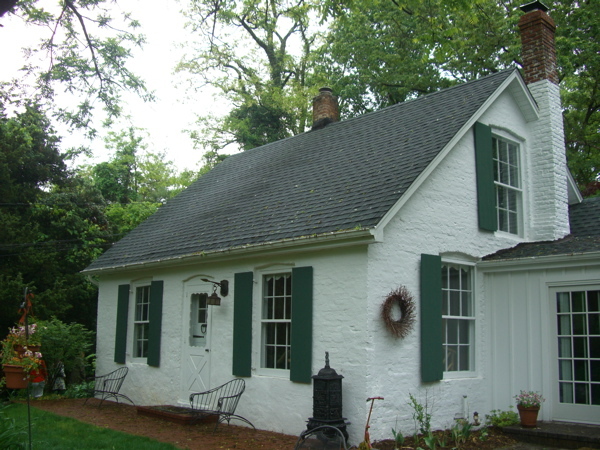 Mudge remodeled and expanded the house in the 1970s. The current owners acquired it in 200X and expanded the kitchen. The small brick house remains intact and distinct, a relic of the property’s colorful past. Marguerite Mudge, who was executive director of the Northport Historical Society in the 1980s, reveled in the house’s history, even if some of the facts were a little off. Huntington Babylon Town History, By Romanah Sammis (Huntington, NY 1937), page 189. Suffolk County Clerk’s Office Mortgage Liber 205, page 590. I grew up at the top of the hill on 25A going east from this house and spent a lot of my youth playing with Mudge children, Alan and Tenney. Knew some of this history from Mrs. Mudge. Thanks for filling in the rest!! Bernhard Osterby was my 3 times great grandfather. I have his family history going back to the 1700’s. Mary was his 2nd wife. Some members of the family changed the spelling of the last name to Easterby and Esterby. Many Easterby’s are still living in East Northport.